The Jonas family have teamed up with the Food Network to create the half-hour special Jonas Restaurant: Family Style, which will take viewers behind the scenes of the opening of their comfort food family restaurant Nellie’s Southern Kitchen in Belmont, North Carolina back in June (16). "For years the Jonas family has entertained audiences with their music, and now we are thrilled to showcase their passion for entertaining with food," said Didi O'Hearn from the Food Network & Cooking Channel in a statement. "In this behind-the-scenes special, viewers will see the hard work that goes into opening a new restaurant, and they will be amazed at how the Jonas family comes together to get the job done." The restaurant, which was named after their great-grandmother Nellie, pay tributes to her Southern hospitality and also serves as a live music venue. The special, which airs in the U.S. on 26 December (16), focuses on the seven days before the opening, when construction still needs to be completed, staff need to be hired and trained and recipes tested. The brothers all chip in to help their parents Kevin Sr. and Denise, with Kevin Jr. doing construction, Joe giving his dad tips about his restaurant venture, and the trio, plus younger brother Frankie, taste testing dishes. 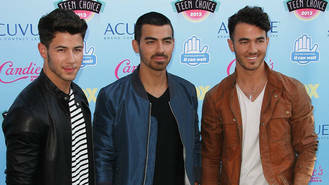 Joe also recruits his band DNCE to give a special surprise performance for all guests at the opening. The singer has his own experience of running a restaurant following the opening of his eaterie Hinterland in Santa Monica, California last year (15). The brothers regularly visit Nellie's and their trips are usually documented on its Twitter page. Following Kevin's appearance, they wrote, "Reason number 1,826,636 you should visit Nellie's: you never know when you'll run into a Jonas Brother."